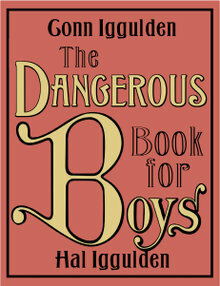 Inspired by the field manuals and do-it-yourself guides of the 1950s—and selling up a storm in the U.K.—Hal and Conn Iggulden's "The Dangerous Book for Boys" is to be released stateside tomorrow. Presented as the missing manual for modern boyhood (and the book the Iggulden brothers would have "given away the cat to get"), the thick red tome covers everything from tying knots, making a tree house, and hunting for rabbits to quoting Shakespeare, communicating in codes and talking to girls. Scattered among the do-it-yourself gems are digressions on great historical battles, tales of bravery and courage, and valuable pieces of boy-knowledge such as a complete list of baseball MVPs from 1931-present and a brief overview of the history of artillery (Conn Iggulden is a well-respected writer of historical fiction known for the Emperor series, based on the life of Julius Caesar). Update: After being out for a day, it's already the #13 book on Amazon's top sellers list. well, ive found what i want for my birthday.